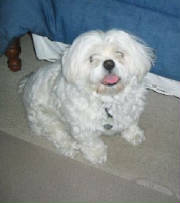 These seven pictures below are of our Henry. 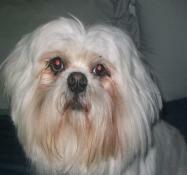 He is a Lhasa Apsos, and is 10 years old. Born in Okla. City. 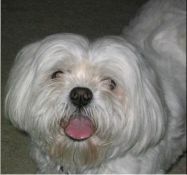 His hobbies are: Watching TV, playing ball, and going for walks. 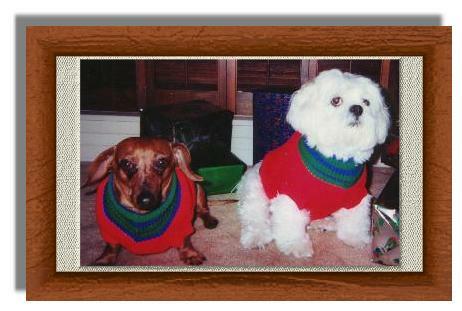 These are the new sweaters we got for Henry and Neslie. Hen wanted boots also, but they cost to much. These are Stacy's two little cats. Top: Murphy (On left) just turned 10 years old. Murphy and Molly in picture on right. Two pictures below - Top: Murphy's 10th birthday party (March 4th). Looking at one of his presents, a nice soft new bed. Bottom picture: Molly has found Murphy's new bed and has konked out in it. These are Richard's two great little cats. They get along well with Stacy's Murphy and Molly, shown in pictures above.